Our scientists perform the research at the heart of LASP. LASP employs 65 scientific researchers. 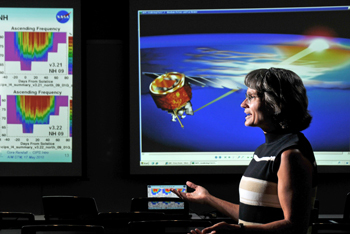 Some of our research scientists also serve as CU professors in departments ranging from the Department of Atmospheric and Oceanic Sciences to the Department of Geological Sciences. In developing areas of focus for space- and aircraft-based missions, our researchers define the technology required to collect data and answer scientific questions. LASP scientists have served as Principal Investigators on missions and instruments to every planet in the solar system, Pluto, and beyond. LASP researchers are conducting science or working on missions related to the sun (SORCE, SDO, Solar Probe Plus), Mercury (MESSENGER), Earth (GOES, RBSP, AIM, STEREO, MMS, THEMIS, LADEE, TSIS, TIMED), Mars (MAVEN), Jupiter (Juno), Saturn (Cassini-Huygens), Pluto (New Horizons), and the outer solar system (Voyager 1 & 2). For more information on current missions at LASP, see About: Mission & Project History.